Arcing, sometimes called an arc flash, occurs when electricity flows or discharges along an unintended path. Electricity jumps during an arc to a nearby grounded object. Arc faults, caused by low, erractic electrical flows, commonly occur due to frayed or exposed wires. They can occur anywhere in a building. While half of arc flashes occur in appliances, computers and other items that run via electricity, 36 percent of arcs occur in electrical panels. Arcing in electrical panels usually occurs at circuit breaker connections. 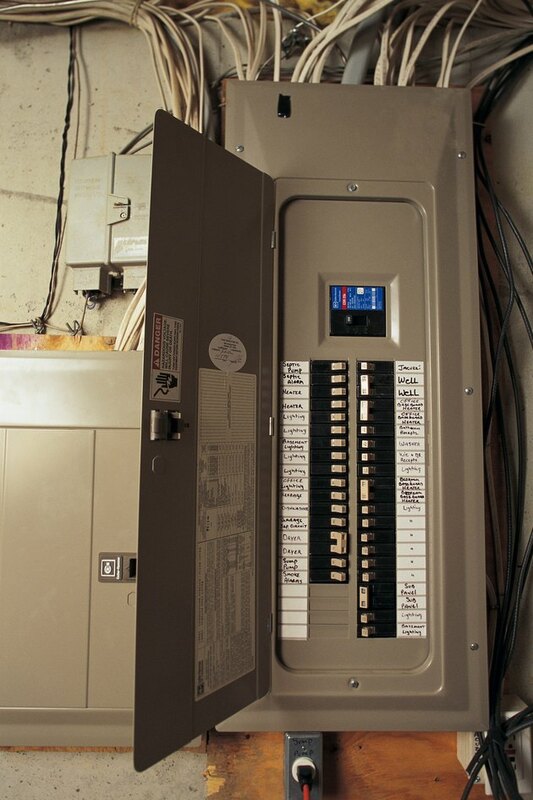 Arcing in an electrical panel occurs when circuits that make up the panel become overloaded. Overheating can occur where a circuit breaker connects to an electrical panel bus. It can damage the bus as well as the connection, making equipment unreliable and prone to failure. Damaged circuit breakers may not perform properly when excessive currents occur. Instead of tripping when excessive or dangerous current occurs, damaged circuits may continue to let electricity flow, leading to overheating and possible arcing. Conditions in or around an electrical panel can contribute to possible arcing as well as to the arcing's severity, should it occur. Electrical panel wiring should never be exposed outside the box. Combustible materials, including gasoline, paint thinner and similar liquids, should be kept away from the vicinity of the electricity panel. Over-fusing, or using too many fuses inside an electrical box, can cause too much electricity to flow through the circuitry, leading to overheating and arcing. Fuses that blow, or circuits that trip frequently, can indicate a possible arcing hazard. Other indicators of potential arcing include burn marks or a burning smell near the panel, as well as buzzing or cracking sounds. Electrical panels made by at least two manufacturers have, in field tests, been shown to harbor faulty construction that can lead to arcing and possible electrical fires. JL Home Inspection claims that Zinsco electrical panels have faulty circuit breaker connections that may cause the units to blow out panel side casings in explosions or may continue to allow electrical flow even when in the off position. Federal Pacific Stab-Lok (R) Electrical Panels also have a high incidence of faulty circuit breakers, according to JL Home Inspection, that may fail to trip when needed. Such failures are considered latent hazards, as they don't directly cause arcing but contribute to it. Most faulty panels were manufactured in the 1970s or earlier. Beginning in 2002, the National Electrical Code required that all new construction include arc fault circuit interrupters on branch circuits inside electrical panels. AFCIs look like normal circuit breakers and fit into electrical panels in the same manner, but they are able to detect dangerous electrical currents that may produce arcs. They are similar to ground fault circuit interrupters (GFCI), which are outlets with circuit breakers that protect people from electrical shocks in rooms such as bathrooms and kitchens. What Causes a Breaker Box to Catch Fire?